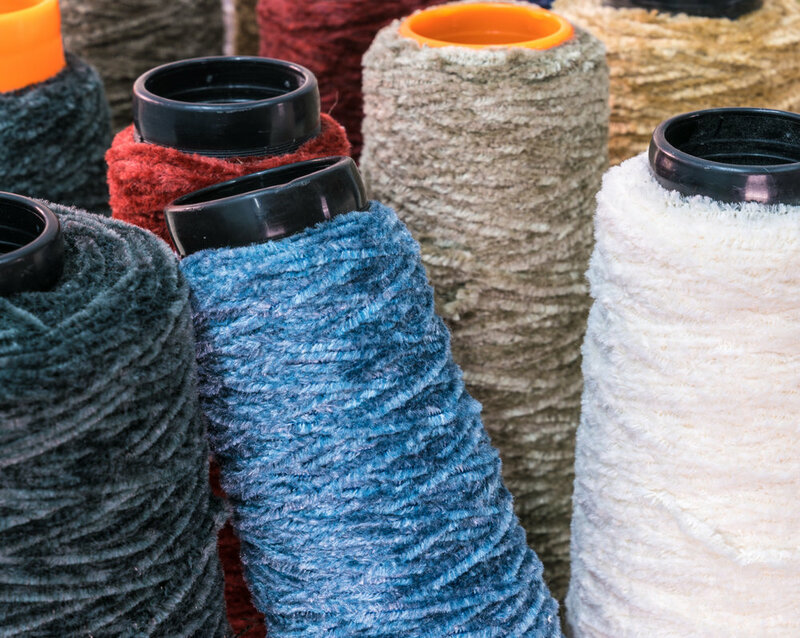 Performance Fabrics: Performance Yarns or Chemical Treatments? One of the most important properties of a performance fabric is that the fabric is cleanable. There are only two ways to achieve cleanability: start with a yarn that is inherently stain resistant or apply a stain repellent finish. Above: Since Olefin contains no dye sites, even mustard and ketchup can't stain Revolution. Solution dyed polypropylene, also called Olefin, is the only yarn for upholstery and couch fabric that is inherently stain resistant. Olefin cannot be dyed using traditional methods that use water because it has no “dye sites” and won’t stain. Olefin can’t be printed on or dyed in water like polyester, acrylic, nylon or natural fibers like cotton, rayon, hemp and bamboo. 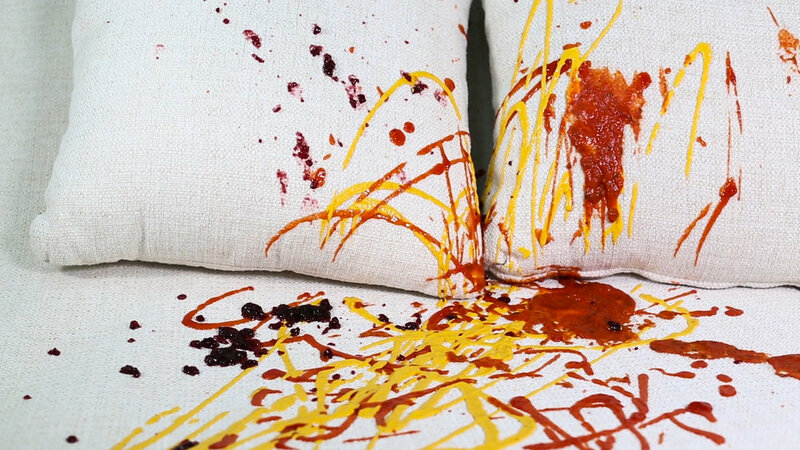 That’s why Revolution is one of very few fabrics that can stand up to permanent marker and mustard! To learn more about Olefin, click here. All Revolution fabrics are solution dyed, also known as “dope dying”. In this process, pigments are mixed in the liquid polymer and literally become part of the yarn. The other synthetic upholstery fibers like acrylic, polyester and nylon can also be solution dyed, but they are still stainable unless they are treated with stain repellent chemicals, most often Polyfluorinated Chemicals (PFCs). Cotton and acrylic are so easy to dye that you can literally dye them in your sink....the easier a fiber is to dye, the more stainable it is. Fibers like polyester and nylon require a lot of heat (energy) and pressure, but are still dyed in water. Many companies suggest that their fabrics are cleanable because of solution dyed yarns. This is very misleading. Unless the fabric is Olefin, this claim is untrue, but the average person wouldn’t know that. For example, a friend’s wife recently visited three furniture stores. At all three she was shown two very well known performance brands, Sunbrella™ and Crypton™. When she told the retail sales associates that she didn’t want those brands because they’re treated with PFC chemicals, all three sales associates said that wasn’t true and said the cleanability came from the yarn, not a treatment. This is totally false. Sunbrella's website tells the consumer what to buy to “re-treat” the fabric when the original PFCs wear off. Crypton™ admits that they use a PFC C6 finish, but claim that their process makes it impossible to wear off. There’s no proof given as to why it won't wear off...I guess we’re supposed to take their word for it? I’ve been in textiles for over 30 years, and spoken to several expert textile chemists....they all agree with me that textile finishes wear off over time and especially after cleaning. In fact, the United States Environmental Protection Agency (USEPA) just released a report about PFC's that states, “hand to mouth transfer from surfaces treated with stain protectors, such as carpets, is thought to be the most significant source of exposure for infants and toddlers" (Green Science Policy Institute Newsletter, May 31, 2018). I don’t see why exposure to treated upholstery would be any different. Other producers of PFC treated fabrics like Live Smart™ by Culp™, say that the chemicals completely permeate the fabric because they are applied to the yarn or the fabric is run through a “bath” and totally submerged. Both of these processes have been used for years and neither is new, innovative or going to stop the finish being released into the atmosphere through direct contact or breaking down over time into household dust. As I noted in my last blog, "The Path of Least Resistance", it was great to see several new PFC free fabrics introduced at the High Point Furniture Market in April. Milliken™ introduced Breathe, a “fluorine free, plant-based" product that makes natural fiber like cotton and linen and recycled polyester cleanable. The company insists this is not a treatment, but part of the yarn... huh!? Any woman who has owned white jeans or anything linen, knows how prone these fibers are to staining. If it’s not a treatment, how’d it get there? Did they feed the chemicals to the cotton and flax plants? Is there some new GMO version of these plants? I seriously doubt it. Recycled polyester will also stain without treatment, so I have the same questions relative to that claim. “Plant based” sounds like total greenwashing to me, because it really tells me nothing. Ethanol is plant based, but I don’t want it on my sofa. I also question what solvent is used since they DON’T claim the treatment (that isn’t a treatment) is water based; if it was, I feel certain they would tout it. There is no fluorine in the product, but have they simply made a “regrettable substitution” of other halogens like chlorine or bromine? I have no idea. Greenwashing like this is rampant in our industry, and I’m afraid it will be with us forever, just like PFCs. Check out the organic yogurt section of your grocery store next time you’re there. Look at the bottom of a container. Every one will have the triangle with “5” inside it and PP. The material used to make the yogurt container is exactly what we use to make Revolution, because polypropylene is considered one of the safest types of plastics. I encourage people to fact check everything from independent sources. If you do, I believe you’ll at least think twice about buying treated fabrics and other products that claim to be “green,” but don’t give you any real information about what’s in them. *To learn more about how Revolution performance fabrics are made and the steps we take to lessen our impact on the environment, please watch the video below.